(PhysOrg.com) -- In the past 50 years it has become commonplace to think of Earth as a nurturing place, straining mightily to maintain equilibrium so that life might continue and flourish. The Gaia hypothesis, named for the ancient Greek goddess of Earth, even put forth the idea that our planet behaves as a kind of giant organism, with its complex systems finely tuned to compensate when one system gets out of kilter. But actually it is the Gaia view that is out of kilter, says Peter Ward, a University of Washington paleontologist who has looked closely at conditions that existed during numerous mass extinction events in Earth's history. In a new book, he suggests the planet ultimately is inhospitable to life, and that life itself might be the primary reason. Rather than Gaia, he invokes the darker Medea from Greek mythology. "The Medea hypothesis says life is already shutting down Earth as a habitable planet. Not just the diversity of life, but the actual biomass," Ward said. "Life keeps evolving, and there are unintended, often negative, consequences." 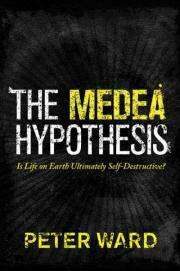 "The Medea Hypothesis: Is Life on Earth Ultimately Self-Destructive?" was published in April by Princeton University Press. In the 208-page book, Ward argues that humans have to use engineering to manage their environment or face potential extinction if the Earth is left to manage itself. "The engineering I'm talking about is not girders and sky shields. It's engineering microbes to take over food production and energy production," he said. Microbes have undergone evolution, a sort of natural engineering, throughout Earth's history, he said, and humans have the ability to guide such changes to clean the environment, for example, or regulate carbon dioxide in the atmosphere. Like Gaia, Medea is a mythological character, though she is decidedly much darker in nature. Medea was married to Jason at the time he pursued the Golden Fleece but, according to legend, he left her and in revenge she killed their two children. The evolution of oxygen-producing organisms twice plunged Earth into ice ages as carbon dioxide, crucial for photosynthesis, was stripped from the atmosphere. The evolution of the first true animals caused extinction of most stromatolites, layers of microbes living in sediment in the oceans' intertidal zones. The result was somewhat more complex life forms, but a vastly smaller volume of living matter. The evolution of the first forests 400 million years ago is considered one of the great events in Earth history. But tree roots pushed into subsurface rocks, exposing them to increased weathering. The weathered elements again stripped carbon dioxide from the atmosphere and plunged the Earth into a 90 million-year ice age. "The irony is that we have way too much carbon dioxide right now, but we should stash it in a bank because we're going to need it," Ward said. "The end of life as we know it is when we reach just 10 parts per million of carbon dioxide in the atmosphere." Currently, carbon dioxide is at 380 parts per million and rising, creating a greenhouse effect that most climate scientists say will greatly increase temperatures around the world, with some severe consequences. For example, with the melting of mountain and polar ice sheets, the world's most-productive agricultural land will be submerged and humans will struggle to find food, Ward said. He noted that throughout Earth's history, carbon has been stripped from the atmosphere and stored in trees, rocks, even the oceans. He said those processes will continue until atmospheric carbon dioxide drops to 10 parts per million, a point at which no plants can live. Once plants are gone, within 20 million years the oxygen will plummet to 1 percent of the total atmosphere and life as we know it will end. "Then you've gotten to a point where it will be forever impossible to get diversity of life back. It will be forever impossible to regain an oxygen-rich atmosphere. That's not Gaia. It's the opposite of Gaia," he said. He notes that of 15 mass extinction events in Earth's history, only the one 65 million years ago that brought an end to the age of dinosaurs was likely caused by a comet or asteroid crashing into the planet's surface. The others all resulted from Earth's own processes. "There's no Gaia. There's just this dumb, blind life. It tries out all kinds of new things that are good for new kinds of life but are detrimental to everything else that exists. The innovations lead to disaster," Ward said. He added that, contrary to recently popular beliefs, the planet likely would not somehow "heal itself" if all humans were suddenly removed. Instead, he said, humans are the key to saving the planet and, in the end, are perhaps the only true Gaian force. "We're not renting. We're the owners, but there can be a cost to the rest of nature of our ownership," Ward said. "There is an easy fix - the only fix is intelligence. Knowing that there is a problem is what will get us out of it. We're the only ones who can put our hands on the controls." Where Lovelock was correct though is that life should be viewed as a biogeochemical system, not just a table guest. Ultimately the most devastating phenomenon would be volcanic activity shutdown and the weakening of the core's dynamo. Volcanoes are the ultimate source of CO2 and thus an essential part of life. If you want to see what happens to a planet where volcanic activity has ceased pretty much entirely, take a look at Mars. He doesn't seem to be aware that the Sun heats up over time. If the CO2 level doesn't drop over time the Earth will heat up until the water boils. This will happen eventually no matter what happens to the CO2 levels but it will happen faster if the CO2 rises instead of going down. "Once plants are gone, within 20 million years the oxygen will plummet to 1 percent of the total atmosphere and life as we know it will end." Huh. I think that without plants, life as we know it - would pretty much end right now. Ethelred, what do you mean by "Sun heats up over time..until water boils" ? Sun has a cycle, so will not ratchet up continuously to heat up the earth. Even Solar cycle correlation with earth temperature is not widely accepted as a major cause. Nothing to do with the Solar cycle. Well nothing that I know of. Its inherent in the way suns burn their fuel. As they age stars get hotter. The was cooler in the past. Neither of those are wrong in what they say but in what they leave out that will long before the the sun goes giant. Hard to find one that isn't about GLOBAL WARMING or the Red Giant phase. - suns warming main sequence - seems to have worked though. As the Sun consumes its core Hydrogen, it slowly grows brighter with age. We see a brighter, hotter, and slighly bigger Sun today than when it formed. This trend will continue so long as the Sun is on the Main Sequence. You usually hear that life on Earth will last for 4 billion years more or more. That's wrong if our understanding of the Sun is reasonably correct. The steady brightening trend will spell trouble for the Earth in the distant future. * The extra sunlight triggers a Moist Greenhouse Effect. A "Moist Greenhouse Effect" is one in which most of the water in the atmosphere is driven off into space. This will likely mean the end of large surface life on Earth, though some types of marine life and simpler lifeforms might survive in the deep oceans or underground. This effect take a long time but must be taken into account when dealing with the beginning of life on Earth and when it will end. Barring us doing something about it. Like put up a shade or move the Earth. I gotta go back to writing ALL my posts in Notepad. If I edit that to put in the missing words the links will break. Remember, every molecule of fossil fuel carbon was atmospheric CO2 in the past. So the concentration had to be much than today in an atmosphere orders of magnitude higher pressure than today. The higher partial pressure, lower molecular weight oxygen and nitrogen components have/are continuously escaping into space. What will happen here on earth will be the same that has happened on Mars - the atmosphere will become thinner and thinner until it becomes impossible for higher life forms to survive. This will occur long before the sun runs out of fuel and starts to expand. In the end, it may be our successors that terraform the atmosphere to keep it hospitable for themselves. I think that without plants, life as we know it - would pretty much end right now. Photoplankton and the food chain above it. I think the engineering of microbes is the better discussion and proposed release points of them. Do we engineer a new carbon trapping plankton and is it tasty enough for whales to eat. Do we realse a carbon trapping grass into the Serengeti will the zebra like it. Or place the microbes like paint on our tallest buildings. Remember, every molecule of fossil fuel carbon was atmospheric CO2 in the past. So the concentration had to be much than today in an atmosphere orders of magnitude higher pressure than today. There is evidence that CO2 levels were much higher in the past. However the Sun was colder. That should have made the poles warmer than today and the fossil evidence agrees with that. The higher partial pressure, lower molecular weight oxygen and nitrogen components have/are continuously escaping into space. I am not aware of any evidence for that happening. Oxygen and nitrogen are fairly heavy themselves,and most of the oxygen that reaches high altitude is converted from a diatomic molecule O2 to ozone O3 which is heavier than O2. Helium is certainly lost. Maybe small amounts of hydrogen as well but free hydrogen is very rare in an oxygen heavy atmosphere. Mars has a much lower escape velocity and no magnetic field. Plus volcanic activity is long gone. Look at Venus for a better idea. It has lower gravity than the Earth and its much closer to the Sun. It doesn't seem to be losing air any more the the Earth is. I thought the book was about the long term. The article at least has it covering several ecological disasters from tens of millions to billions of years ago. I think the engineering of microbes is the better discussion and proposed release points of them. That was only a small part of the article. However I am not adverse to such a discussion. But I may disappear out of laziness. I don't have as much time as I would like for some of the knock down drag out discussions. They have to pretty interesting to get me to really dig deep. The same answer to all the rest as well. It won't make a bit of difference. Whales, grass and even paint aren't sequestering CO2. Growing trees instead of grass does. Growing grass or moss FASTER than it can be eaten does IF it doesn't decay which is why I mentioned moss. Keep in mind that the grass that isn't eaten usually gets burnt and some people use pete as fuel. I suppose whales do sequester some CO2. The pelagic whales skeletons often go all the way to the abyssal depths and there the carbon may stay. Heck, concrete sequesters CO2. Whether it absorbs more than is released in making it is another question. Much if not most of life on Earth doesn't need or want oxygen. Being an oxygen breathing organism I too am predjudiced against our anaerobic bacterial friends. Mr Ward needs to revisit the last mass extinction. He should find that the extinction had occurred prior to the Yucatan impact. There were very few witnesses. Au-Pu needs to provide something resembling evidence for that claim. Otherwise I will assume there is a non-scientific agenda involved. Witnesses are a lousy source of evidence anyway. Physical evidence is more reliable.